Miami Auxiliary Bishop Peter Baldacchino preached this homily July 10, at the Mass marking the conclusion of the U.S. Convocation of Consecrated Virgins, celebrated at MorningStar Renewal Center from July 6-10, 2018. Firstly, to all of you I bring greetings from Archbishop Thomas Wenski, our local Ordinary. This year he has not been able to be with you in person. Then, I must say that I am glad to be able to celebrate this closing Mass with you. Indeed, I must admit that I am glad that Archbishop is away because I get to be here with you in his place! This 2018 United States Convocation of Consecrated Virgins opened here at MorningStar Renewal Center in the Archdiocese of Miami on the feast day of the young St. Maria Goretti, whom I guess is very special and quite close to all of you. Her personhood, her sanctity, is definitely a model for you all, with her total desire to love God and his commandment, defending her virginity at all cost. What sense does it have for a woman in today’s world, in this particularly superficial and materialistic culture in which we all are immersed, to choose virginity: to consecrate herself to the service of God and of the Church? Is this not crazy? Well, in a sense it is madness, a folly of love. It is simply a falling in love, an irresistible, all-encompassing attraction of love! In fact, one does not fall in love with a sublime idea, neither with some ideal of great value, be it Peace or Justice; nor even with a noble virtue, be that Chastity, Poverty or Charity! Indeed, one falls in love only with a person. And that person can only be Jesus, who first loved you and gave himself for you. Everything starts with an initiative of the Lord. The prophet Hosea uses this expression: “I will lead you into the desert and speak to your heart ... I will make you my bride forever.” With these words the prophet, in spousal imagery, depicts the relationship that God wishes to establish with his people, the Church. God describes the personal relationship with those whom he calls to share his love-life in an intimate manner, saying: I will make you my bride. The experience of consecrated life is nothing other than a story of love. Today’s Mass readings prepare us for these final moments of your convocation. The prophet Hosea warns his people against the consequences of forgetting their creator. He calls them to conversion, to return to Him, to abandon the idols of silver and gold they had made. Indeed, God is truly a jealous God, as he proclaims himself to be in the Decalogue; and this because he is deeply in love with his people. With an anxious heart He seeks the one who can return his love: We love because he has first loved us, St. John tells us in his letters. And your consecration, dear sisters, is directly a fruit of this love that God has for each and every one of you. In this sense, even the Gospel we have just heard, the calling of his apostles, is an election that our Lord makes out of love. Love for the people to whom he sends them in mission, to heal them, but also a sign of love towards them. He makes his chosen ones part of a greater mission, of a greater vocation. A vocation of oneness (of unity) with the beloved, calling them to bring to the whole world the announcement of the mercy, forgiveness and tender love of God, while inviting them to be witnesses of all that in our own lives. Dear sisters, by your very way of life, you are witnesses that consecrated virginity is by no means a renunciation of one’s humanity. Experience has shown that only when one feels loved and loves in return, can one accept to hand over one’s life. And in this very ‘handing over’ of one’s life there lies the secret of one’s human fulfillment. “Remain in my love,” Jesus will say in the Gospel: only in this way can you bear fruit. Effectively, by remaining in the love of the Lord, the consecrated virgin fulfills her fruitfulness: She does not become barren, but rather she is ‘mother.’ A non-biological mother, a spiritual mother who generates children in faith, a mother capable of giving affection well beyond conjugal and family ties, a mother who with her ‘spousal love’ helps spouses to also experience marriage as a relationship of fidelity, of love and of fruitfulness with the Lord. “Remain in my love”: Consecration unites one, FOREVER, with the Lord. But being with him, does not mean to isolate oneself; locking oneself in God’s intimacy. Anyone who is with the Lord is also sent to announce and to witness his love. This is indeed the task of every consecrated person. Now, all of you are called by name and sent by Jesus to announce his love! You are part of the Church; an integral and important part of it! It is no coincidence that the consecration in the Ordo Virginum takes place in the Cathedral Church. This temple is the center, the symbol of the local Church: It is the place where the bishop, pastor of the diocese, exercises the most important acts of his ministry. The consecrated virgin places herself at the service of the local Church in a relationship of filial obedience and close collaboration with the bishop. Dear sisters: love the Church! You have become spouses of Christ in the Church and for the Church, because the Church is the spouse of Christ. Dear sisters, how much our heart is called to be a ‘virginal’ heart! A heart that does not follow the transient feelings of selfishness and self-centeredness that are a constant threat to our love towards God. A heart that is ‘virgin’ because it is purely and uniquely united to God. Your convocation of these past few days has clearly presented to the entire world a totally different view of the world itself, a countercurrent movement, that puts the love of God at the center of life, in which virginity takes on a particular meaning. You are called to make present within this secularized world of ours that God is enough. That the love of Christ can be totally fulfilling, and that it can bear fruit. You are called to be an example to all the faithful in the Church. Indeed, ALL Christians are called to be ‘virgin,’ because the birth of Christ in each one of the faithful — a birth that comes about through baptism — imbues virginity in every Christian. ‘Virginity,’ because Christ is virgin; ‘virginity’ because Christ in us brings forth a total gift of our own self. This is a gift that it is not a sacrifice, since, having received it from Him, we can return it to Him out of love. Now, this is indeed good news for all: In Christ, within the Church, we ALL can become virgin, new, renewed, pure, clean! It seems to me that this is a true definition of joy. The joy of intimacy with the one true love. 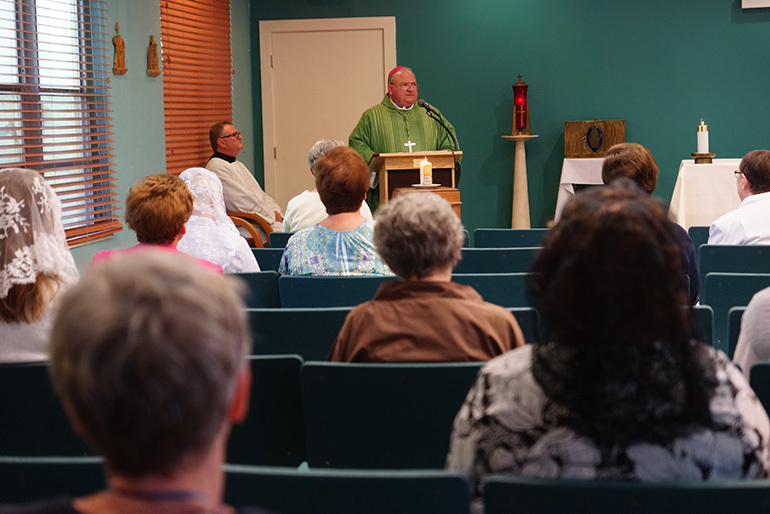 Miami Auxiliary Bishop Peter Baldacchino preaches the homily at the closing Mass July 10 of the U.S. Convocacation of Consecrated Virgins, celebrated at MorningStar Renewal Center in Pinecrest.